By the time he died in 1919, Carnegie had given away $350,695,653. At his death, the last $30,000,000 was likewise given away to foundations, charities and to pensioners. Oil was not the only commodity in great demand during the Gilded Age. The nation also needed steel. The railroads needed steel for their rails and cars, the navy needed steel for its new naval fleet, and cities needed steel to build skyscrapers. Every factory in America needed steel for their physical plant and machinery. Andrew Carnegie saw this demand and seized the moment. 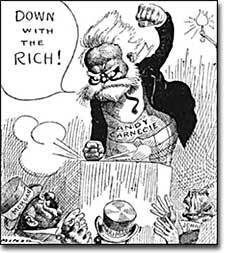 Like John Rockefeller, Andrew Carnegie was not born into wealth. When he was 13, his family came to the United States from Scotland and settled in Allegheny, Pennsylvania, a small town near Pittsburgh. His first job was in a cotton mill, where he earned $1.20 per week. His talents were soon recognized and Carnegie found himself promoted to the bookkeeping side of the business. An avid reader, Carnegie spent his Saturdays in the homes of wealthy citizens who were gracious enough to allow him access to their private libraries. After becoming a telegrapher for a short while, he met the head of a railroad company who asked his services as a personal secretary. Millionaire Andrew Carnegie spoke against irresponsibility of the wealthy and sharply criticized ostentatious living. During the Civil War, this man, Thomas Scott, was sent to Washington to operate transportation for the Union Army. Carnegie spent his war days helping the soldiers get where they needed to be and by helping the wounded get to hospitals. By this time, he had amassed a small sum of money, which he quickly invested. Soon iron and steel caught his attention, and he was on his way to creating the largest steel company in the world. When William Kelly and Henry Bessemer perfected a process to convert iron to steel cheaply and efficiently, the industry was soon to blossom. Carnegie became a tycoon because of shrewd business tactics. Rockefeller often bought other oil companies to eliminate competition. This is a process known as horizontal integration. Carnegie also created a vertical combination, an idea first implemented by Gustavus Swift. 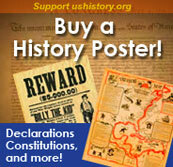 He bought railroad companies and iron mines. If he owned the rails and the mines, he could reduce his costs and produce cheaper steel. Carnegie was a good judge of talent. His assistant, Henry Clay Frick, helped manage the Carnegie Steel Company on its way to success. Carnegie also wanted productive workers. He wanted them to feel that they had a vested interest in company prosperity so he initiated a profit-sharing plan. All these tactics made the Carnegie Steel Company a multi-million dollar corporation. In 1901, he sold his interests to J.P. Morgan, who paid him 500 million dollars to create U.S. Steel. Retirement did not take him out of the public sphere. Before his death he donated more than $350 million dollars to public foundations. Remembering the difficulty of finding suitable books as a youth, he helped build three thousand libraries. He built schools such as Carnegie-Mellon University and gave his money for artistic pursuits such as Carnegie Hall in New York. Andrew Carnegie was also dedicated to peace initiatives throughout the world because of his passionate hatred for war. Like Rockefeller, critics labeled him a robber baron who could have used his vast fortunes to increase the wages of his employees. Carnegie believed that such spending was wasteful and temporary, but foundations would last forever. Regardless, he helped build an empire that led the United States to world power status. The Carnegie Library of Pittsburgh has prepared this online tribute to its benefactor and namesake. The text article contains inline hypertext links to cartoons and other information about Mr. Carnegie. But most interesting is the wav file of Carnegie speaking, providing his listeners with a quotation from his "Gospel of Wealth" denouncing an ostentatious lifestyle. The statement is in stark contrast to the way most captains of industry, including Carnegie himself, actually lived. Andrew Carnegie's philanthropy continues to grow as the years pass. The original endowment in 1911 to the Carnegie Corporation of New York of $135 million was worth over $1.55 billion in early 1999 despite the millions of dollars given away each year. This corporation was created to provide grants to benefit the public. Read the page entitled "The Corporation's Program" to learn how the grantmaking foundation operates, then browse the site to see what grants have been awarded recently. Do you have a crackerjack idea that needs funding? Check out the page on grant restrictions and proposals. This is the official site of Carnegie Hall in New York City, one of the foremost concert halls in the world. Find out about the current season of performances, or follow the "Carnegie then and now" link for a look at the hall's history. The timeline is well illustrated. Click on the dates in the top frame to progress through the years. Henry Bessemer invented the process that Carnegie used to produce steel. Visit this site to learn more about Bessemer and his achievements in many areas. You will also find some links to sites related to steel manufacture. This page offers a brief history of the university which Andrew Carnegie founded in 1900 and which quickly became one of the top universities in America. Here is a webpage of quotations attributed to Andrew Carnegie which reflect his philosophy of business and life.